This session describes how Lean Production and Kanban has been applied to game development. Lean principles and Kanban tools have been used by a number of developers, including the presenter, to slash production costs by over 50%. As a complement, or replacement, to Scrum, Lean/Kanban provides predictability, transparency and optimization for complex game production. 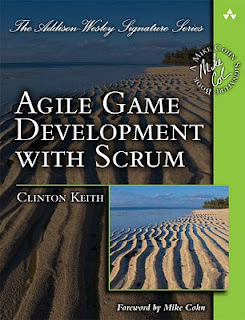 "Agile Game Development with Scrum" book is shipping! I'm very happy to announce that the book is shipping from Amazon! Thanks to my manuscript reviewers: Bendik Bygstad, CJ Connoy, Jeff Lindsey, Erik Theiz, and all of 38 Studios, Jason Della Rocca, and Senta Jakobsen. Their level of detailed feedback was tremendous and added a great deal of value to the book. This book took almost two years to write. During this time, I received much feedback and advice from those who downloaded draft chapters and helped steer the direction the book took: Bas Vodde, Chris Oltyan, Diogo Neves, George Somaru, Heather Maxwell Chandler, Jamie Briant, Julian Gollop, Karen Clark, Lia Siojo, Lyssa Clark Adkins, Martin Keywood, Paul Evans, Philip Borgnes, Robert Bacon, Ron Artigues, Rose Hunt, Scott Blinn, Sheldon Brown, Steve Sargent, Wanda Meloni, LaRae Brim, Keith Boesky, Aðalsteinn “Alli” Óttarsson, and Barbara Chamberlin. Extra thanks to Justin Woodward for all his artistic help and advice! To Bruce Rennie, Michael Riccio, Rory McGuire, Stephane Etienne, Caroline Esmurdoc, Shelly Warmuth, Chris Ulm, and Alistair Doulin. I thank them for letting me use their words.